Vintage bridal shower invitations with flowers wreath and old mason jar with bride&#;s and groom&#;s initials. 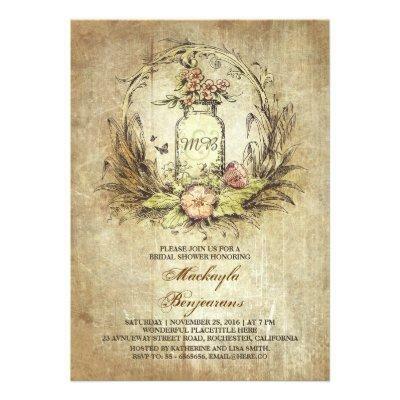 Romantic invite for rustic country bridal shower in the barn or garden with vintage theme design. ---------Please contact me if you need help with customization or have a custom color request. ---------- If you push CUSTOMIZE IT button you will be able to change the font style, color, size, move it etc. it will give you more options!